The evidence-based clinical content in VetCompanion has been developed by veterinary and evidence-based medicine experts using the latest guidelines, consensus statements, systematic reviews, randomized controlled trials, and other pertinent studies. Evidence-based medicine (EBM) was described in 1996 as the conscientious, explicit, and judicious use of current best evidence in making decisions about the care of individual patients. The practice of evidence-based medicine means integrating individual clinical expertise with the best available external clinical evidence from systematic research (Sackett DL, Rosenberg WMC, Gray JAM, Haynes RB, Richardson WS. Evidence based medicine: what it is and what it isn't. BMJ. 1996;312:71–2). EBM has become widely accepted in human medicine and serves as the foundation for point-of-care clinical decision support resources for physicians. Evidence-based veterinary medicine (EBVM) involves the incorporation of EBM principles into the veterinary profession. It has been described as a formal strategy to integrate the best research evidence available, combined with clinical expertise as well as the unique needs or wishes of each client in clinical practice; much being based on results from research studies that have been critically-designed and statistically evaluated (Evidence-Based Veterinary Medicine Association [EBVMA], ebvma.org). EBVM is not “cookbook” veterinary practice. 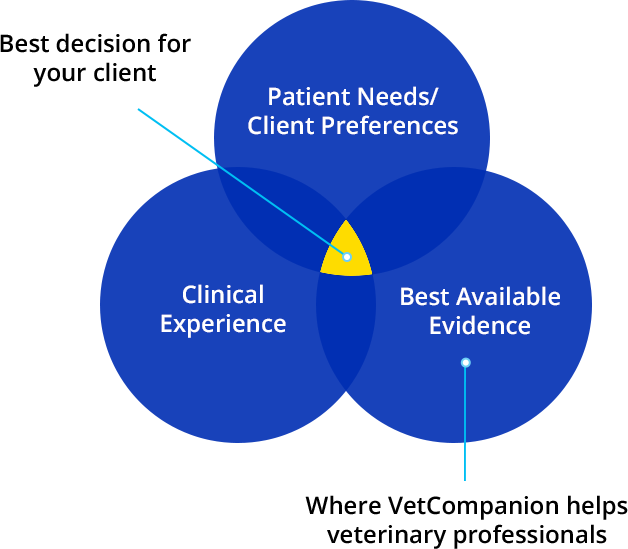 The evidence should inform the clinician, who will then use their expertise to determine if and how the available evidence applies to an individual patient, and how that evidence should influence clinical decisions. VetCompanion topics are chosen based on ongoing consultation with practicing veterinarians and members of the VetCompanion editorial board, review of relevant new guidelines, consensus statements, and new research studies that become available, review of frequently asked questions posted on veterinary consultation websites, and suggestions from VetCompanion users. These monographs represent the most pertinent and commonly encountered conditions in veterinary medicine, as well as topics of significant clinical utility, such as fluid therapy and transfusion therapy. Topics are being added continuously, to provide an ever-growing resource for busy veterinary professionals. The goal is to provide the most comprehensive and trusted point-of-care resource available for veterinary professionals who care for small animals. The available evidence for each clinical topic in VetCompanion is reviewed and pertinent citations are included in the evidence section of each monograph. An evidence rating is provided for each citation, to characterize for users the degree to which a given topic is supported by evidence. 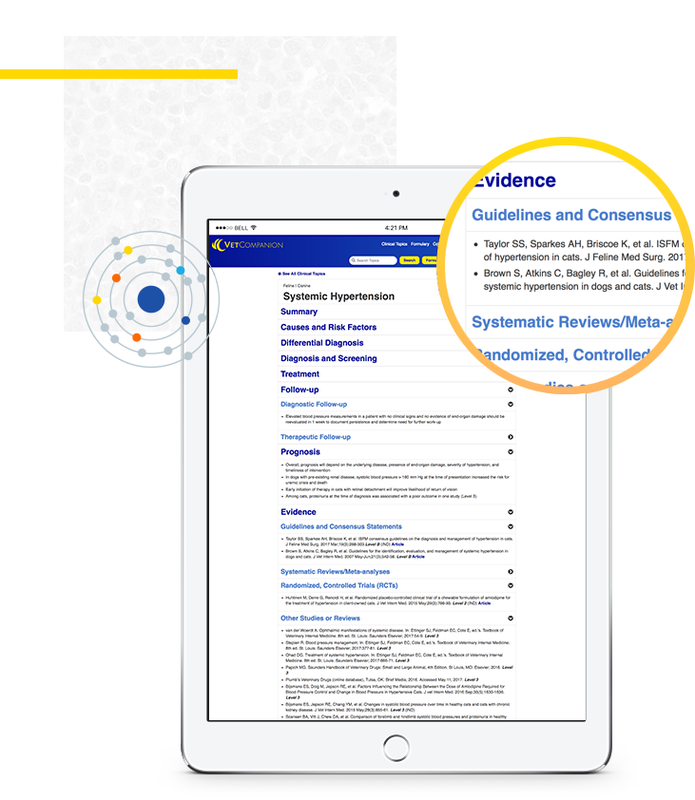 Links are provided for guidelines, consensus statements, and studies with higher evidence ratings (Level 1 or 2), so that users may more easily access and review the best supporting evidence at their convenience. The VetCompanion evidence rating system has been designed conservatively, so citations will tend to be rated lower in the absence of evidence meeting specific, rigorous criteria. The evidence rating system is derived from The Strength-of-Recommendation Taxonomy (SORT), which is endorsed by the American Academy of Family Physicians. Some human medicine decision support, point-of-care resources use systems similar to or derived from SORT. All pertinent guidelines, consensus statements, systematic reviews, meta-analyses, randomized, controlled trials, and observational studies are included for each clinical topic. The most recent and/or pertinent Level 3 studies and reviews are selected for inclusion in each monograph. VetCompanion editorial staff update content on an ongoing basis, to ensure it reflects the most current evidence-based information available. This involves regular review of a variety of resources to identify new and pertinent evidence that may augment or change existing clinical content. When new clinical recommendations are published, such as new guidelines, the information is added or updated as soon as possible, as appropriate. Decisions regarding whether new evidence is sufficient to merit a revision of existing content are made by VetCompanion editorial staff. Due to the rapidly changing nature of pharmacological information, users are encouraged to reference a reputable veterinary drug formulary as needed to confirm medication doses and obtain detailed information on adverse effects and contraindications. VetCompanion will not cite or include references from sources that are sponsored by commercial enterprises/companies or written by authors who report sponsorship from commercial enterprises/companies, unless there are clearly stated conflict of interest policies in place and described that ensure any such studies, guidelines, or recommendations are not subject to potential biases due to such industry funding or sponsorship. Absent that, VetCompanion will include studies, guidelines, and recommendations that are published in peer-reviewed journals or that explicitly state that they have been independently peer-reviewed. Such citations will be identified in the evidence section of monographs with the following designation: (IND). This designation will appear after the evidence rating (Level 1, 2, or 3). Such designation does not confirm that industry sponsorship-related bias exists, but indicates that readers should apply their own judgment regarding the potential for any such bias in the provided evidence. Evidence ratings are based solely on the VetCompanion evidence rating methodology and do not take into account the potential for industry sponsorship-related bias. For more information on industry sponsorship and research outcomes, please review this link from the Cochrane Collaboration. All members of the VetCompanion editorial board sign a conflict of interest form, declaring that they are not currently involved with any commercial interest in the veterinary field, in a compensated role, such as a paid member of an advisory panel. They also agree to immediately notify the VetCompanion editor-in-chief if they plan to take on such a role in the future and to voluntarily step down from the editorial board prior to beginning any such engagement. In signing the form, editorial board members confirm that they have no relevant conflicts of interest to report to the VetCompanion editorial staff. The Chief Veterinary Medical Officer and Editor-in-Chief review all VetCompanion content, including new monographs and updates. Members of the editorial board are responsible for peer reviewing selected VetCompanion monographs. In addition, a panel of veterinary specialists provides peer review of VetCompanion topics. Finally, content-related comments from VetCompanion users are reviewed, with revisions made as appropriate.